ROLEX REF. 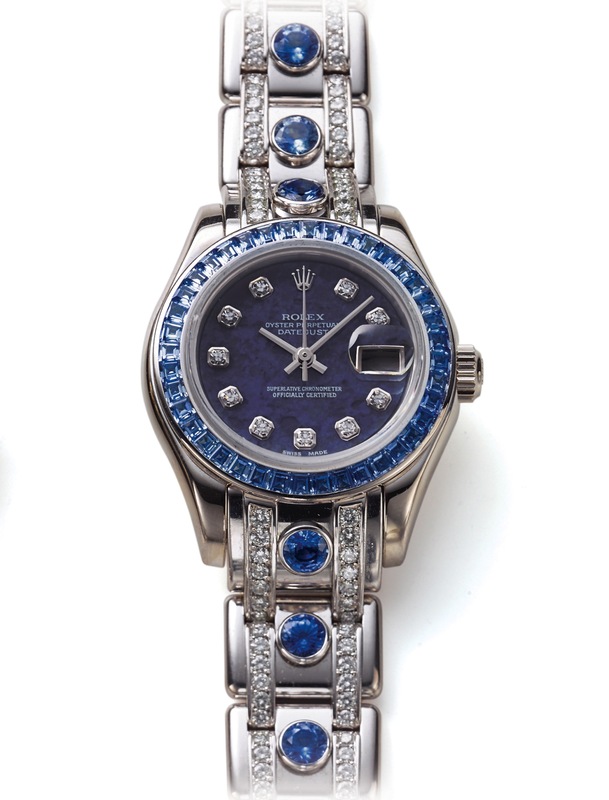 80309 LADY DATEJUST PEARLMASTER DIAMOND SAPPHIRE AND WHITE GOLD Rolex, "Oyster Perpetual, Datejust, Superlative Chronometer Officially Certified," Ref. 80309. case No. A662991. Made in 1998. Very fine and rare, center seconds, self-winding, water- resistant, 18K white gold, diamond and sapphire-set lady's wristwatch with date, sodalite diamond dial and an 18K white gold, diamond and sapphire-set Oyster "Pearlmaster" bracelet with concealed deployant clasp. Three-body, solid, polished and brushed, screw- down case back and crown, bezel set with 40 baguette sapphires, sapphire crystal with cyclops lens. Sodalite set with round diamond indexes, aperture for the date. White gold bâton hands. Cal. 2135, rhodium-plated, 28 jewels, straight line lever escapement, monometallic balance adjusted to temperatures and 5 positions, shock absorber, self-compensating flat balance spring. C. Three-body, solid, polished and brushed, screw- down case back and crown, bezel set with 40 baguette sapphires, sapphire crystal with cyclops lens. D. Sodalite set with round diamond indexes, aperture for the date. White gold bâton hands. M. Cal. 2135, rhodium-plated, 28 jewels, straight line lever escapement, monometallic balance adjusted to temperatures and 5 positions, shock absorber, self-compensating flat balance spring. Dial, case and movement signed. DIAM. 29 mm. THICKNESS 11.5 mm. Approx. overall length 155 mm.